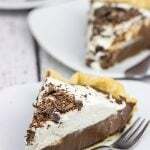 This classic Chocolate Cream Pie recipe features a silky smooth chocolate filling topped with creamy whipped cream. Sprinkle some shaved chocolate on top, and you've got a delicious dessert to share! Working on a lightly floured surface, roll dough into 12” circle. Lay dough into a lightly greased 9” pie pan. Fold the extra dough over and crimp using two fingers. Place parchment paper or foil in pan and fill with dried beans or pie weights; bake for 20 minutes. Remove paper/foil and beans/weights. Continue baking for 4-6 more minutes, or until crust is golden brown. (Note: If edges begin to brown too quickly, cover just the edges with foil.) Remove crust from oven and let cool completely. Using a double-burner or a heatproof bowl set over a gently simmering saucepan of water, melt 2 oz. of the chocolate. Once melted, brush the bottom of the crust with chocolate. Chop 8 oz. of chocolate and place in a large mixing bowl. Add butter and vanilla; set bowl aside. Using a medium saucepan, add sugar, cornstarch, cocoa powder, espresso powder (optional) and salt; whisk until well combined. Add heavy cream; stir until well combined. Finally, add egg yolks; stir until well combined. Place saucepan over medium heat and whisk in the milk. Bring mixture to a boil; let boil for 1 minute. Remove pan from heat and pour into mixing bowl with chocolate and butter; stir until chocolate has completely melted and mixture is smooth. While still hot, pour/press mixture through fine-meshed strainer into a clean bowl. Pour filling into pie pan and press plastic wrap directly to surface. Refrigerate at least 4 hours or overnight. Chop the remaining 2 oz. of chocolate. Before serving, garnish pie with whipped cream and chopped chocolate.